This is a solid walnut Edwardian Pedestal Desk. We have reconstructed the top, as the original inset had already been replaced with something else when we bought it. 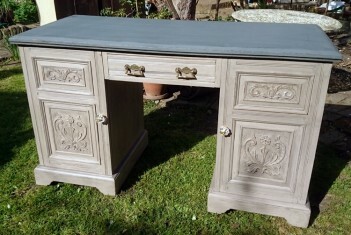 It has been fully prepared and then painted using Grand Illusions Vintage Paint in Mousse, Fossil and Noir. The top and the insides have then been varnished for practicality and then the body of the desk as been waxed with a blackened clear wax (our own creation), to bring out the carving and created a lovely texture. The desk sits on its original castors. The drawer handles are old ones, and we have added the new glass handles on the door (the originals were broken). Please click on the photos to see larger scale images.